In the course of reading your excellent posts on the garbology project, it occurred to me that just as we have been talking about “foodways” as a label for the entirety of human behavior surrounding food, we need to think more about the full range of human behavior that relates to the throwing away of things—garbageways, to coin a term. This may seem like less of a universal phenomenon than the eating of things—after all, we tend to think of the discussion of garbage as a relatively recent phenomenon. Yet people have been discarding things since before they were anatomically (not to mention behaviorally) modern Homo sapiens. The few odd bits of debitage that survive from the production of Oldowan tools attest to this fact, but doubtless there were also discarded bits of husk, bones, and the pieces of plant or animal that could not be transformed into perishable tools. In fact, archaeologists interact primarily with things that have been diverted from use by human garbageways, and thus understanding the full range of waste disposal behaviors should really be obligatory, if we hope to interpret the archaeological record with any degree of accuracy. For example, the near-absence of certain valuable materials in the archaeological record, depending on broad contexts, must often be attributed to recycling or repurposing. A rather vulgar but illustrative example of this phenomenon is the Domus Aureus on which the Roman emperor Nero wasted huge amounts of public money during his reign. Naturally, archaeologists have never found remnants of the tons of gold and precious gems (not to mention Parian marble, bronze sculpture, etc. ), that were devoted to the house’s construction, because after Nero’s assassination, these were diverted from the stream of garbage that leads to the archaeological record. In fact, the very recycling of the Domus Aureus could be interpreted as a political act, in the same way as one might interpret participation in certain foodways as a political act (think, for example, of Kirk’s careful parsing of ingredients to make her PB&J sandwich in class today: she took pains to explain that the use of wheat bread and jam with seeds left in put her in a distinct socio-political group). Thus, our consumption and abandonment of materials share many, many qualities, most of which are useful from an archaeological perspective. Thanks for your posts; I’ll send you each some comments on them soon. Garbology is the study of modern trash. In my own opinion, archaeology and garbology are basically the same thing; archaeologists look at past material culture (making general statements here) and garbologists look at modern material culture. Much of what archaeologists find is in fact the trash of ancient people. 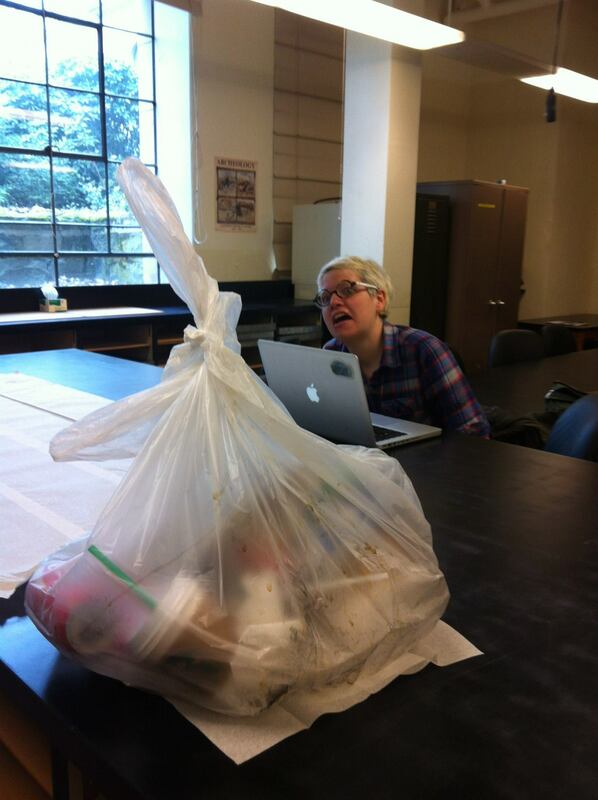 This week for our lab, my team and I studied two bags of trash from the UW campus. One bag was taken from Denny Hall, and one was taken from the Physics building. While sorting and recording the piles of garbage from each bag, we took a few minutes with every new handful and tried to analyze where it came from, who threw it away, and why they threw it away. Because it was relatively early in the day (around 10:30am) when we collected the trash, there were several breakfast-related food and drink items, especially in the form of coffee or tea from Starbucks. 1. They are most likely female. 2. They must live near campus, to have to time to wait in a long and slow line just to get coffee. Or they arrive ridiculously early. Or they are late to class (I tend to see that fairly often, students who arrive late just so happen to have Starbucks in their hand). 3. They have money to waste on a 4-6 dollar cup of coffee. Being the judgmental female that I am, these are the things that I automatically assume when glancing at the large amount of Starbucks cups in the trash (most of which were compostable!) However, I also realize that these assumptions I make are mostly likely wrong (as the popular saying goes, “when you assume, you make an a** out of u and me”). When I sit down and really think about it, I know very well that the coffee in the garbage cans could have come from any person, male or female, young or old, professor or student, and that my other automatic assumptions are likely just as off as the first. Garbology is a wonderful field, with so much potential and so many real world applications. But it is also important to know that what you see in the garbage, from the past or present, cannot tell you for certain and without a doubt the details of someone’s life, actions, and ideals. It’s hard. But we can do it! Since last year, we can see many compost bins show up on campus and in the buildings. UW also announced the increase of recycle and compost rate, it is a good news for us and to the environment where we live. This quarter, I and my colleague have a chance to run a little garbology research on campus. 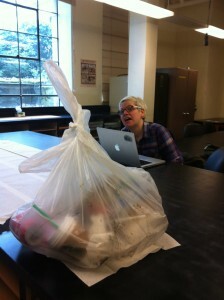 We pick up two trash bags from Physics Building and Denny Hall and analyze them. Originally we want to see if there are any differences of trash between ‘Hard’ and ‘Soft’ science. Except the Physics-related magazine, it seems hard to differ these two trash from this single study. If we want to derive some more concrete results, we better to have a long term observation of the trash from these two buildings. However we do find some interesting results other than our original plan. After the analysis of trash, we find that there are many compostable stuff in the trash bag, so we sort the trash again. For the trash bin context, there is no compost bin close to the Physics trash where we collect, but there is one compost bin close to the trash bin where we collect in Denny. It seems the set of compost bin beside the trash bin indeed influence our behavior of throwing trash. Most of the paper towels, napkins and coffee cups are compostable, and some bio-plastic cup for cold drinks are compostable as well, but we still find a lot of these stuff in the trash. Compare to where I came from, Taiwan, the recycle and compost process is relatively easy, we just need to sort our trash and put them into right bins. In Taiwan, we have to clean and rip off the un-recyclable parts before we dump it. That why I say it is easy to do out here. The blah group did whatall and made such-and-such pottery. Easy for us to say, huh? But when we’re confronted with our own archaeological materials, stuff gets a little more messy. In a few senses of the word. When we look trash from our own place and time, we have a better idea of what’s going on archaeologically. We know the social implications of generic brand ham. We know that when we’re nervous, we fiddle with the tab on our soda can. We know who drinks peppermint mochas, and who’ll chug iced black. But do we really? I don’t think that’s necessarily the case. Consider! For all our contemporary expertise, we’ve got baggage—stereotypes, assumptions, unacknowledged grey areas in our almost-encyclopedic knowledge about the nuances of modern social interaction on a college campus. Nevertheless, we might be tempted to draw conclusions about exactly who used that trash bin. We must resist! Profs’ll chew creamsicle-flavored gum, and sporty bros’ll order venti pumpkin spice lattes with two shots of vanilla. People think garbology is cool because it gives us some greater insight into our own time, through our trash. They’re right—it is, indeed, pretty damn cool. But as we dive into the dumpster, let’s keep in mind that this is about behavior and culture, and let’s keep our assumptions in check. As archaeology students it should be of little or no surprise that what is thrown away can say more about how people live than the objects that are kept and used, and that is even more true in our current consumerist culture. These disposable objects help highlight how certain categories of food and drink items are consumed depending on the activities that are occurring in the area where they are disposed. Our group, consisting of Roger, Lauryl and myself, decided to look at two high traffic areas with what we believed to be vastly different use profiles. The first, Thompson Hall is located on a prime thoroughfare with the HUB on one end, and the Quad on the other. The second location, the Burke Museum Café is also a high traffic area due simply to it being at the museum as well as the easy access to the Ave. Each receptacle location, at least theoretically, would have different types of users due to their locations on campus: Thompson Hall would receive more ‘mobile’ food packaging, snack food and coffee, as well as some more illicit materials, while the Burke Café would see a wider spectrum of trash with evidence of tour groups and families. Not surprisingly this was exactly what our group found during the investigation, as our samples were chosen due to our knowledge of the campus and general use patterns. As with all research there is one caveat. Our trash was collected in the late morning and early afternoon, meaning there would be a bias towards breakfast and lunch activities. Without knowing the emptying schedules of the bins, it is impossible to determine if there is activity from later in the day and evening that is not represented in the samples we collected. Along this same line of reasoning, there may also be a visible difference in the types and amounts of trash disposed of in outdoor and indoor receptacles depending on the season in which a sample was collected. Does Garbology have the ability to capture the activities that people were doing, even if those activities are less than half a mile away from each other? To see if garbolog-ical methods have a fine enough resolution to distinguish between activities in different areas of the University of Washington campus, a group of us (Roger, Jacob, and myself) did a little dumpster diving (sort of). We collected two different sets of trash from standalone (non-sorting) trash bins located at the southeast corner of the Burke Museum, and at the west facing edge of Thompson Hall. Both collections were in high pedestrian traffic areas and were not in close proximity to any sorting trash bins. Theoretically, that means the entirety of activities that were going on in the areas adjacent to the bins should be represented in the trash collections, and there should be no bias towards compostable, organics, or recyclable materials in either the Burke of Thompson trash sets. The result of our snooping in other peoples trash paid off (but we thought it would, we had expectations after all that trash has no secrets). It turns out that garbology has a fine enough resolution to differentiate between activities that produce trash, even though the activities are occurring on the same campus. In the Burke collection there is clear evidence of off-campus food sources and café-related items being consumed, which is consistent with our expectation that the Burke trash bin will represent lunch-time activities from both the academic (students, faculty, staff) and general public (school and tour groups, museum visitors). The Thompson collection also demonstrated a reliance on portable food items and evidence of scholarly activities (book packaging), although the scholarly activities were in lower abundance than we expected. Illicit activities like alcohol consumption and smoking in a non-designated zone were clear in the Thompson collection, and this is probably because that trash bin faces a wooded garden where such activities could go on unnoticed. Interestingly, both bins had roughly equal amounts of organics, compostable and recyclable materials, suggesting that people use these specific trash bins out of convenience. The results tell us that people tend to misbehave near Thompson hall, and that putting sorting bins in these high traffic areas has the potential to divert a great deal of the trash that were observed in the two collections.